The Utah State University Pediatric Audiology Clinic serves children from birth to 22 years of age in Cache Valley as well as surrounding areas in Utah and neighboring states. When a child is diagnosed with hearing loss and fit with hearing aids or an assistive listening device, it is important the device be worn all waking hours. This is important in order for them to learn language appropriately and to be active participants in the world around them. As part of the USU Pediatric Audiology Clinic’s services, a bank of loaner hearing aids and FM/DM devices is maintained. This assures that all of the children served in this clinic, who utilize hearing aids or a FM/DM device, will always have access to functioning equipment even if their personal equipment has to be sent for repair. It also allows children to be fitted with hearing aids who have just been diagnosed with hearing loss while families are waiting for outside funding to purchase their own. The IHC Community Partner Fund supports nonprofit, health-related organizations and other nonprofit community groups who share a mission similar to Intermountain's mission. The fund is for community health improvement services, health education and conferences, activities conducted to improve health, fund-raising events for health-related groups and other similar programs and services. Elizabeth Preston, a pediatric audiologist at USU, applied for funding in order to have excellent technology available to use as loaner devices. 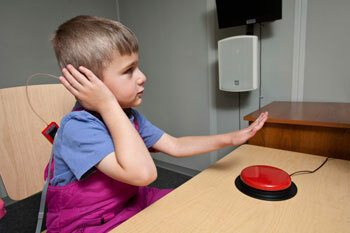 The USU Pediatric Audiology Clinic takes pride in providing excellent evidence-based care. By receiving this funding, children will be fit with a loaner hearing aid if needed so they do not ever have to go without amplification.